Saturday, July 9: Stop Bombing Libya! Transportation from Boston to DC available! Contact us at boston@answercoalition.org for transportation from Boston to D.C. on July 9. 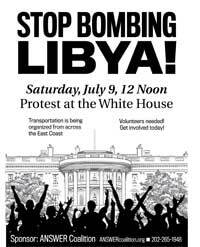 ANSWER Boston is organizing transportation to Washington, D.C. for the demonstration at the White House on Saturday, July 9, at noon to demand: Stop Bombing Libya. Please contact us at boston@answercoalition.org right away for details on transportation. The Washington, D.C., July 9 protest is the next step of opposition following the hugely successful Cynthia McKinney Eyewitness Libya nationwide speaking tour. This is an illegal war. The United States and other NATO powers are dropping massive bombs and missiles in an effort to carry out regime change in the country that possesses the largest oil reserves in Africa and the ninth largest in the world. At the moment, the government tells us the country is so broke that tens of thousands of teachers and nurses have to be fired, yet there is again limitless funds for another war. The civil war that commenced in February in Libya provided a perfect pretext for the United States, Britain and France to use overwhelming military power to overthrow the government. Their goal is not more democracy and freedom, or to “protect civilians.” These powers have predatory commercial and military interests in the region that contains two thirds of the world’s known oil reserves. Humanitarian intervention is just an empty slogan masking the imperial character of the war. Civilians are being killed by the U.S./NATO bombing. The country’s infrastructure is being destroyed and will undoubtedly be source of lucrative reconstruction contracts for Halliburton, Exxon/Mobil, and other western corporations and banks. Join us on July 9 to say Stop Bombing Libya, End the Occupation of Afghanistan and Iraq! Download the flyer for the July 9 "Stop the Bombing of Libya" demonstration. Endorse the July 9 “Stop the Bombing of Libya!” action. Please donate today. We can’t do it without your support.